My OUTLANDER Purgatory: MOBY ALERT: Old Tennent Church VIDEO! SPOILER ALERT!!! The following post and video make many references to situations in Written in My Own Heart's Blood. MAJOR spoilers ahead if you have not read that far in the Outlander series yet!!! Oh MAN do I have a treat for you!!! My friend, Shannon recently gave me an article from the Asbury Park Press about the Old Tennent Church in Manalapan, NJ...site of some of my favorite scenes in the entire Outlander series. (Shannon and I are paying our Halloween visit next week.) Weird New Jersey (way cool magazine about...well...weird things in New Jersey!) did a piece on the church and cemetery...and little did I know, there is VIDEO!!! 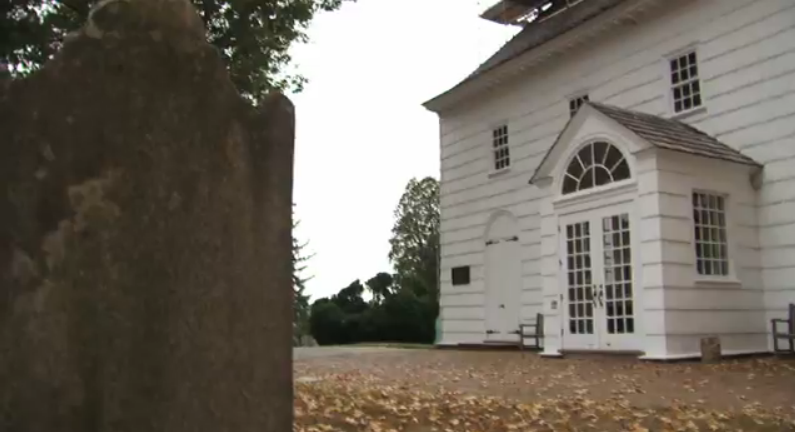 Video of the church...video of the cemetery...close ups of Battle of Monmouth graves...and even possible blood stains from a pew where a dying soldier was allegedly lain. THIS IS THE FIND OF THE CENTURY...at Halloween and Samhain, no less!!! Click the photo watch the video...and ENJOY!! I JUST found your blog.... AND I LOVE IT! Your videos along with your recaps are A-MAZ-ING. I see you have a twitter account. brb. I am now following you on twitter. Today, I stopped following @samheughan :-( it was a wee bit much to keep up with. I dinna like it much. ANYHOW Thanks for bringing the books back to life for me. Herself would be so proud. How do you set a profile on this site? I canna figure it out. Thanks Tori!!! I'm glad you found MOP!!! :) I do the blogging and my sister, Tracey does the Tweeting...so I'm glad you found that, too. Dinna forget we have MOP Chat on Monday nights at 9PM Eastern. Hope to see you there!